The CE Concierge earpiece was designed for Vocera, Theatro, and Ascom devices. We designed this with the Hospitality Industry in Mind. The straight through design of the cord helps orient the microphone correctly and requires less unsightly wires. 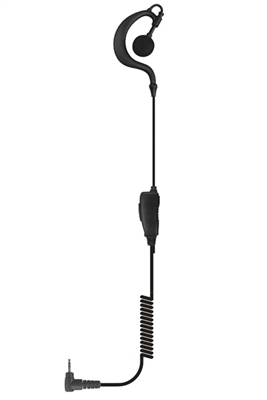 The microphone is somewhat directional making this the perfect earpiece for "noisy" (such as a casino) areas. The Earhook type arrangement is a comfortable solution when people will be sharing an earpiece or do not want something in their ear as in coiled tube style earpieces. As with all Custom Earpiece products the Concierge features Kevlar reinforced wires and stapled strain reliefs for exceptional durability and includes our exclusive one year, no questions, "If you can break it, we'll replace it" Warranty.